Personnel – Darren Barrett: trumpet, vocals; Takeru Saito: piano; Santiago Bosch: keyboards, synth; Youngchae Jeong: bass; Daniel Moreno: drums; Judy Barrett: percussion + guest Kurt Rosenwinkel: electric guitar. 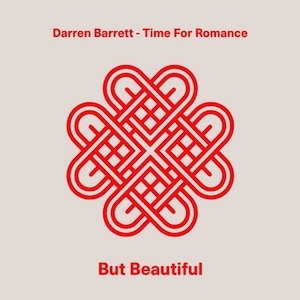 On his new album with the Time For Romance band, Canadian trumpet player Darren Barrett shows an enormous respect for jazz tradition, devoting himself to pure melody and transforming eight classic ballads to be firmly fit in the present. Sporadically, we can sense the same innovative, futuristic vibes that made The Opener, his previous album, an unexpected phenomenon of the contemporary jazz. These are mirrored in tunes like “Everything Happens To Me”, where we find him flirting with hip-hop rhythms and dubstep synthesis while reeling off bop-inflected phrases with long-held notes; and “The Touch Of Your Lips”, here designed with a flamboyant Afro-Latin rhythm and tasteful sound effects while upholding the warm, mellow tone reminiscent of Chet Baker. The passionate guitar of Kurt Rosenwinkel (playing the intro all alone) lights Dizzy Gillespie’s “Con Alma” before the invasion of a percolating Latin rhythm emphasized by the presence of percussionist Judith Barrett. The bandleader improvises with soul, having Santiago Bosch’s synth ‘disturbances’ rolling sporadically in the back. In that way, he is even more persuasive on the wonderfully sedative “Invitation” as well as on “But Beautiful”, in which he has the company of Japanese pianist Takeru Saito as a featured soloist. Both pieces have the foundation builders - bassist Youngchae Jeong and drummer Daniel Moreno - holding on their function of timekeepers. Horace Silver’s “Nica’s Dream” was subjected to a laid-back treatment in order to get an inebriating feel without losing its original soul-jazz flair. It opposes to Benny Golson’s “Ugly Beauty”, which is not so interesting in terms of texture. The album closes with “Every Time We Say Goodbye”, which conforms to the romantic direction with a somewhat cheesy dedication to all the lovers. Besides adding organic sounds to it, Barrett sings the song. These re-imaginations of ballads chosen from the Great American Songbook don’t have the powerful impact of Barrett’s last year’s originals. That wasn’t expected since the nature of the music is very different. However, and despite making us enjoy immortal melodies, the instrumentation and modernistic garnishes of But Beautiful, didn’t captivate me as much as I would have liked.